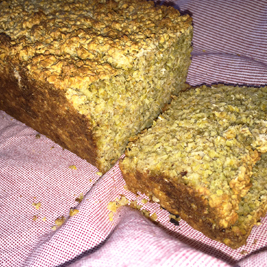 Quick, easy, tasty and very filling fodmap bread, also good toasted for a number of days afterwards. Place in greased loaf tin pressing the mixture down slightly in the tin. Bake at 180 degrees Celsius until golden brown on top and cooked through when tested with a knife. Allow to cool in the tin before turning it out. Read more about FODMAP-friendly foods.